Most Cerebral AVMs in the HHT population are symptomatic. HHT1 patients more likely to have brain AVMs than HHT2 patients. The vessels lack contractile elements and so given direct arterial connection, bleeding from telangiectases can be brisk and difficult to stop. This may be seen with GI Bleeds. 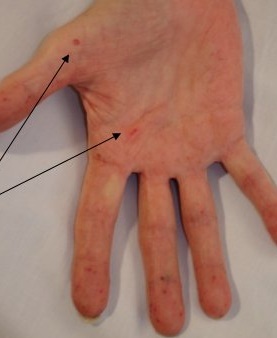 Juvenile polyposis/hereditary haemorrhagic telangiectasia syndrome is caused by mutations in the SMAD4 gene. Epistaxis (nosebleeds): spontaneous and recurrent. Family history: a first-degree relative in whom HHT has been diagnosed using these criteria. Note: These diagnostic criteria were established for adults and can be misleading when applied to children. Angiography is AVM suspected. 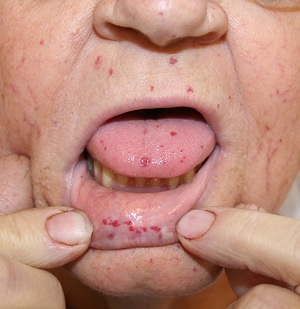 The Spetzler-Martin grade for HHT related lesions is 2 or less in nearly 90% of patients. Bubble echo shown to be a sensitive screen for PAVMs and then CT Pulmonary angiogram if positive bubble echo. This avoids radiation in young adults. This may need repeated at 5 year intervals. Molecular genetic testing is used to establish the genetic subtype of hereditary haemorrhagic telangiectasia in a clinically affected individual and family, and for early diagnosis to allow for appropriate screening and preventive treatment. ABC, Stroke management, Acute management for GI Bleed as needed. Transfusion if needed. Gastroenterology review for GI bleeds. Iron replacement therapy for anaemia. Closure of Pulmonary AVM if embolic stroke by Interventional neuroradiology if needed.Any PAVM with a feeding artery > 1–3 mm detected by chest CT should be considered for treatment by transcatheter embolization. Prevalence and characteristics of brain arteriovenous malformations in hereditary hemorrhagic telangiectasia: a systematic review and meta-analysis. J Neurosurg. 2017 Aug;127(2):302-310.